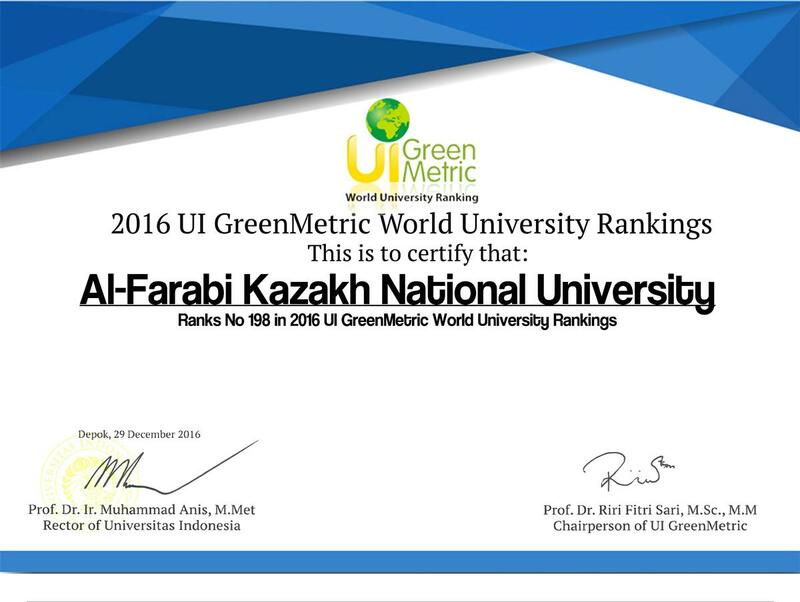 Al-Farabi Kazakh National University on the basis of the ranking took 198 place among 516 universities in the world, gaining 4822 points. Green Statistics (1062), Energy and Climate Change (765), Waste management (750), Water usage (384), Transportation (805), and Education (1056). This is the seventh edition of ranking which compares universities’ efforts towards campus sustainability and environment friendly university management. The ranking was announced by the Universitas Indonesia’s Rector,Prof. Muhammad Anis, along with the Chairperson of UI GreenMetric Prof. Riri Fitri Sari at the Central Administration Building, in Depok campus. The ceremony was also opened by the representative of The Ministry of Environment and Forestry, Republic of Indonesia and also the representative of The Ministry of Research and Higher Education of Republic of Indonesia, Dr. Muhammad Dimyati.